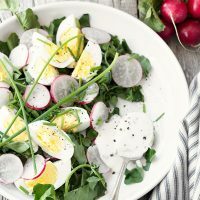 This Watercress, Radish and Egg Salad with Yogurt Dressing is quick, easy, healthy and delicious. Easily made if you make your hard boiled eggs ahead and have them ready in the fridge. 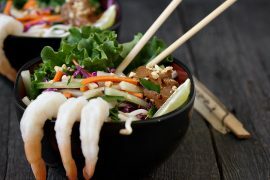 Since my husband is usually looking for a hearty dinner, when it comes to lunch, I try to keep it light, fresh and easy. With an emphasis on the easy. Truth be told, if lunch isn’t easy, I’m sometimes inclined to just skip it and that inevitably leads to mid-afternoon (much less healthy) snacking. This Watercress and Egg Salad is a favourite light, fresh and easy choice. I love watercress. Not only is it a flavourful green, it’s also a super green, chock full of goodness. 1 cup of chopped watercress has only 4 calories, but provides 24% of daily Vitamin C needs and 21% of daily Vitamin A needs! 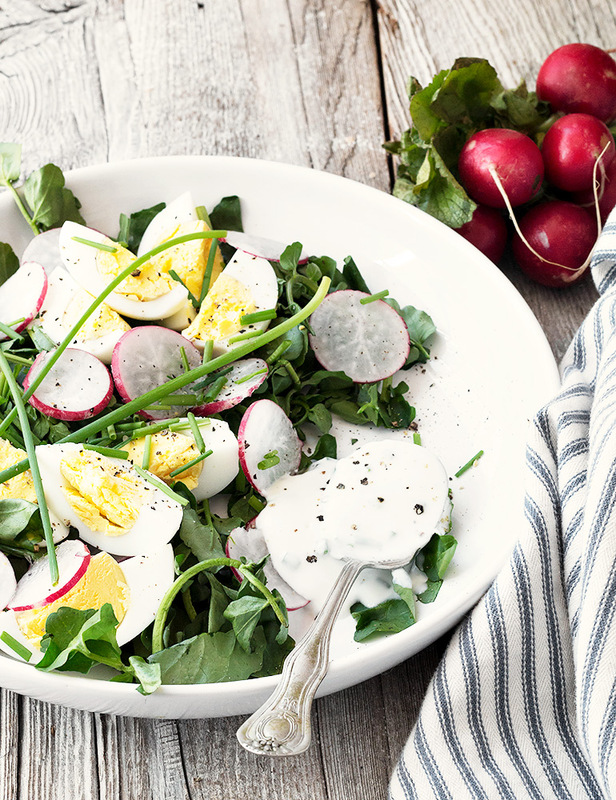 Paired with hard boiled eggs, radishes and a simple yogurt dressing, this one comes together quickly and offers up both delicious and nutritious. If you can’t find watercress, baby greens (spinach, arugula, spring mix etc) are a great substitute. If you are not a radish lover, feel free to substitute something else from your fridge. Chopped celery or cucumber? Avocado or left-over asparagus would all be great. I try to keep hard-boiled eggs ready to use in the fridge whenever I can. I cook them up on the weekend so they are in the fridge all week. They are perfect for this salad, a quick breakfast or even an impromptu egg salad sandwich. Scroll down for more information on hard boiled eggs and how to cook the perfect hard boiled eggs! Place eggs in a single layer in a saucepan and cover with 1 inch of water. Bring just to a full rolling boil over medium-high heat, then immediately cover pan and remove from heat. Let sit in the pan for 10 minutes (set a timer!). Remove from hot water and place immediately in to an ice bath. Let sit in ice bath for 1 minutes, them remove to a bowl to refrigerate or to peel and use immediately. How long will hard boiled eggs keep in the fridge? Peeled or unpeeled, hard boiled eggs will keep in the fridge for one week! I like to keep mine with the peel on and peel just before using. Do hard boiled eggs need to be refrigerated? Yes they do. Can you freeze hard boiled eggs? Nope, unfortunately, hard boiled eggs don’t freeze well. Are hard boiled eggs nutritious? Yes! They are full of vitamins and minerals such as potassium, iron, zinc, vitamin E and folate. With 6 grams of protein and just 78 calories, a hard-boiled egg is a healthy food choice. Ingredients for a single salad. Double or triple as needed! 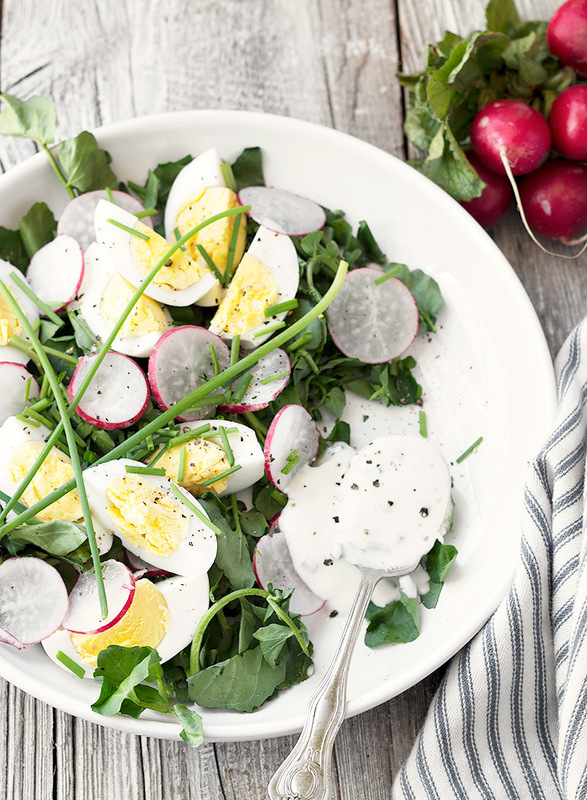 Boil your hard boiled eggs ahead and refrigerate, so they are ready for use in this salad. Do ahead: Prepare hard boiled eggs by adding eggs to barely simmering water. Simmer for 10 minutes, then remove to an ice water bath to quickly cool. Refrigerate hard boiled eggs until needed. 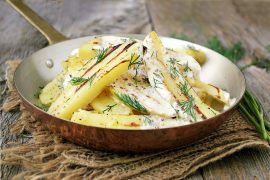 Prepare the yogurt dressing by whisking together all the ingredients. Set aside. To prepare the salad, place fresh watercress on plate. Top with hard boiled eggs, chives and radish. Drizzle dressing over-top. Season with salt and freshly ground pepper, to taste. Enjoy! 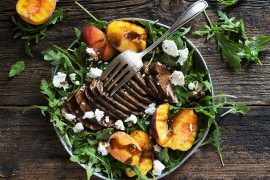 As written, there are only 119 calories in this salad, but it delivers 44% of your daily Vitamin C needs and 51% of your Vitamin A needs. It also has 13 grams of Protein! I am crazy about both watercress and radishes. Love that you use boiled eggs – such a healthy protein. I’d eat this salad daily! I LOVE this beautiful, simple salad Jennifer. 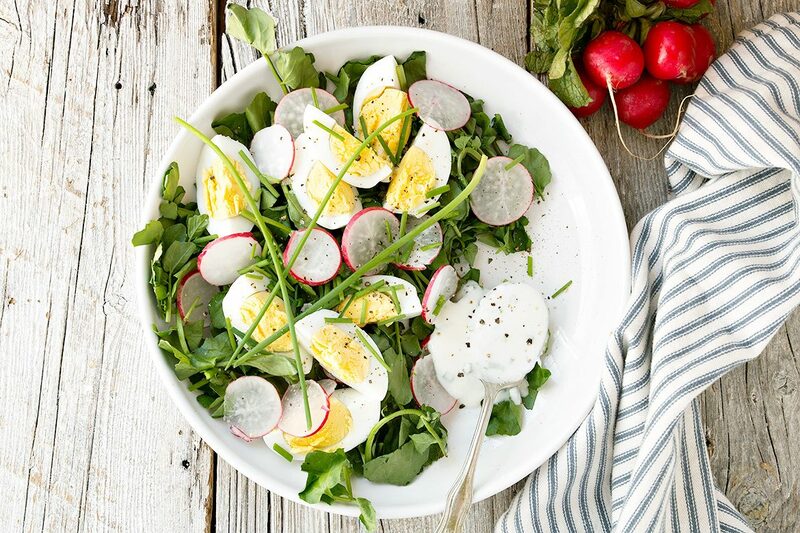 Watercress is so delicious and hard boiled eggs are a great addition to salads. The protein keeps me going and away from the afternoon snacks :) Love the low calorie dressing too! Hope you have a terrific week.